There’s no cosier venue at the Pleasance Courtyard than The Green, the huge inflated igloo that’s home to many of its shows for children this year. In The Just So Stories, kids, their parents and a few solitary grown-ups are invited to dive into the Snuggle Pit, an enticing fluffy mass of colourful floor cushions and cuddly toys. 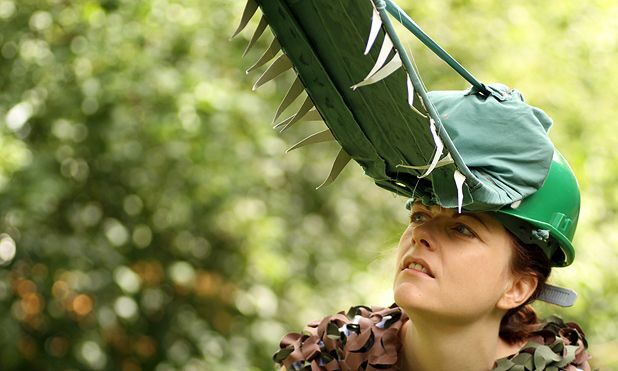 It’s the perfect vantage point for Red Table Theatre’s engaging adaptation of four tales from Rudyard Kipling’s much-loved collection of stories. Using old-fashioned suitcases, vibrant parasols and mesmerising swathes of fabric, the agile performers create a rich and varied landscape that’s a delight to behold. In addition to skilful acting, there’s some beautifully melodic singing that rounds off the end of each tale. All of these elements work together with clever staging to create a captivating show that sustains its one-hour length. But the antiquated language through which the stories are told don’t grab everyone’s attention, and some young minds start to wander after the first tale. The company suggests the show is suitable for ages four and up but six might be a better baseline, though even the youngest audience members are still charmed by the kaleidoscope of images the performers create.